At SHL we are absolutely committed to delivering high quality service and are committed to exceeding customers' service expectations. Our Quality Assurance team audits completed work, and in the interests of continuous improvement, they deliver trade-specific training to our own staff and to our subcontractors. That training educates workers on our customers' standards, specifications and coding systems. SHL utilises a comprehensive and specifically developed Contract Quality Management System (CQMS) to manage quality of all components. Quality Assurance Management Plans and standardised procedures have been instigated throughout the organisation to ensure all company activities are delivered according to industry standards. The Key Message to our Trades Contractors is "Do it Once and Do it Right"
The SHL Quality Assurance team trains internal team members and all trades contractors so that together we deliver work that meets clients’ standards. Quality control is specified in Service Level Agreements with our trades’ contractors. 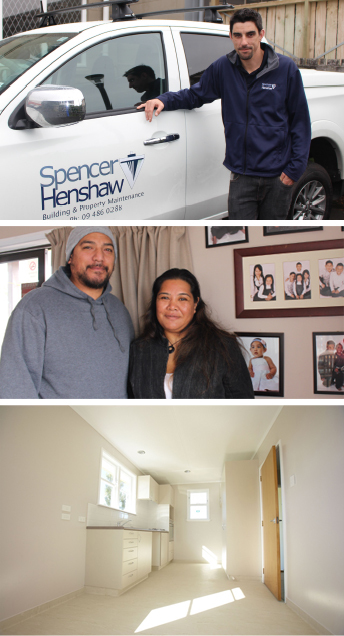 Spencer Henshaw’s audit team audits completed work. They check the jobs’ measurements, coding, invoicing and overall quality, and the results are reported each month. When we finish a job we look around and ask ourselves "if this was my home, would I pay a professional tradesperson for this work?" The answer has to be "Yes".